For those who knew Rodolfo Cieri, his passing earlier this year meant sorrow, sadness and grief. It also rekindled the sweet memories of his presence on the dance floor. 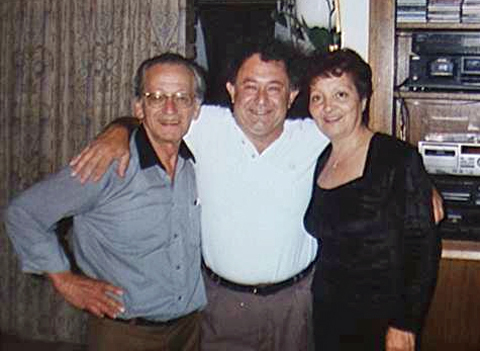 It has taken many months and countless dry attempts, to sit down and listen to three hours of a taped conversation we had with Rodolfo and Maria on June 21, 1996 at our former home in Sunnyvale, California. We first saw Rodolfo and Maria early on June 1996 at a milonga in Berkeley, California. The introduction by the host barely cut across the indifference of a vocal crowd who seemed to have gotten used to the necessary evil of interrupting the milongas with “announcements.” All we could see was an elderly couple tastefully dancing to the Pugliese‘s rendition of Emancipacion. Nineteen-ninety-six was a transition year for our tango dancing formation, so even when the couple on the dance floor was not “hot dogging,” flying or otherwise trying to impress the crowd, we were left in a daze by the craftsmanship and seductive allure of their ever precise and calculated moves. But what really touched me the most, was Rodolfo‘s cherub-like smile as he played with the creative genius of Pugliese coming from the speakers subtly marking the movements of Maria. A few days later, a common friend brought them to our house, where they lived for the remaining weeks of their sole stay in the United States. Rodolfo danced the same way all his life never considering the possibility that something special would ever happen to change the course of his life. It’s not that he didn’t have the opportunity, but he never wanted to dance professionally. That’s just fine with Maria, because If he had started doing it then, we wouldn’t be here together today. More than twenty years went by without dancing and being married with children. When the daughter finally got married herself, Rodolfo was working out of a Ford pick up truck doing what the UPS men and women do today, pick up and delivery of packages. Faced with an empty nest, he didn’t want to consider getting older quicker by coming home to watch television. He had heard about a popular tangueria that was in vogue, Volver, on Corrientes and Suipacha. One Friday, celebrating a windfall of money that had come his way at work, he invited Maria to go dancing at Volver. Arriving early, they told the maitre d’ that they were new to the scene, and asked for a good spot on the dance floor from where he proceeded to watch the caliber of the dancers as they kept arriving. They had seen them dance and asked if they were teachers. No, they were told. They were just milongueros from Buenos Aires and that’s all. Rodolfo said that he always danced because he felt the tango deep inside. Later Rodolfo and Maria joined the young couple at their table and found out that they were staying at a hotel. They invited them to move to their home were they developed a good friendship while teaching them to dance tango the way they knew. Six months later they received a letter and two plane tickets. The trip to France was happening. As they pondered the reality of crossing the ocean on a puny airplane, Rodolfo and Maria couldn’t believe their insane luck on that fateful day of 1988. The woman in question had a dance academy in Marseilles, and she had put together a major production based on the History of Tango. The expensive project played once at Teatro del Molino, and it included a full comparsa of black people entering the stage from behind the public to perform a candombe number that left Maria gasping. Thirty days to the date they arrived in France, Rodolfo and Maria left the woman’s house and moved in with Elena, who with partner Alfredo tried very hard to help them survive for the remaining six months of their stay. Singing, dancing Tango and folklore, Rodolfo and Maria managed to make ends meet stranded in a foreign land, handicapped by the language barrier, with plenty of tools of their own and help from generous compatriots. Rene Fabianelli was one of them. In the years that followed, Rene became the “guardian angel” who organized their successful tours around France and the rest of Europe. Meanwhile in Buenos Aires Rodolfo kept telling friends about their crazy luck, and that one day he’ll open his own Tango Club, appropriately named, Suerte Loca. Rodolfo learned to dance Tango from his father as a kid. His mother objected because she wanted him to go to school and be somebody. Rodolfo did both. He pleased his proud father at the old man’s milongas in La Paternal dancing with sisters and cousins at the tender age of ten. Time came for Rodolfo to go to school. Dad insisted that he devote time to study rather than dancing. The night life could be dangerous and lead to no good. He developed a style and spent years as a night creature of the milongas. When he met Maria, she was barely fourteen. Dating in those days meant meeting her at the street corner by her house while the sun was up. A vampire would have fared better, but he kept his courtship up for almost three years. They have danced together and they have witnessed a time when there were real dancers at every club. Dancers who competed to be the best. Dancers who would never consider imitating anybody else. Dancers who dressed to kill to impress the ladies before dazzling them with their brilliance on the dance floor. They both admire Juan Bruno, the Juan Bruno from the time when he used to dance Tango Salon. father. The elder Cieri had died in 1966 but his presence still weighs strongly on this fragile man with the glassy eyes, leaning against the chair, holding a glass of wine. It seems that his father kept appearing in his dreams. The recurring themes were answers to whatever was troubling Rodolfo at the time. Like a way to finish the barbecue pit he had built on the roof of the house he had constructed by hand, one brick at a time. Or the advice on where and how to install a bathroom on the upper floor. When Rodolfo talks about his father, the tone of his voice lowers, as if he is still aware of his presence. He had repeated time after time stories about the early days of his childhood when the old man taught him to dance the tango in a way he had forgotten. How he began to hate as a child, having to show off in front of Dad’s friends at the neighborhood clubs. Later, when a young Rodolfo lived from garufa to garufa, a dapper ladies’ man at the milongas, he avoided facing a disappointed father with a pointing finger. For years after the passing of the elder Cieri, Rodolfo visited the mausoleum at the Chacarita cemetery. He tried many times to see his father with an inexplicable obsession until the time came for moving the casket from the mausoleum. The family had to decide between ground burial or cremation. Rodolfo convinced the family to have the body cremated and the ashes placed next to the graves of his grandparents. As a truck loaded with caskets arrived, Rodolfo demanded to identify the body. He was going to see his Dad one last time. He was now the only one left in his family and he seemed to wait for his time with resignation, whenever it would arrive. Did he know already about the illness that would take him away four years later? I’ll never know.Like the passing of my parents, Rodolfo’s departure feels like he just moved farther away. We’re reliving the fond memories now as we have finally sat down to watch the videotapes of those great classes in our living room, along with their compelling performances at the Dance Spectrum in Campbell. The two of them dancing canyengue to El chamuyo. 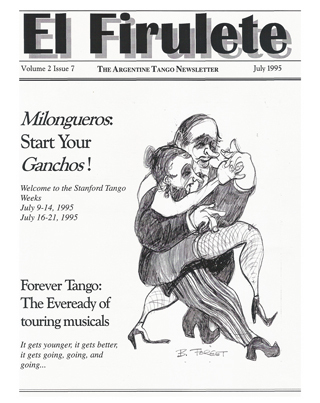 At Stanford Tango Week 1995, Graciela Gonzalez became the stuff of mythic proportions. This diminutive powerhouse of a woman was something the American tango student had not experienced. She was not part of a teaching couple, she taught alone. She was serious and outspoken. She demanded respect not only for herself and the Argentine Tango, but also demanded a self respect for each and everyone of us as dancers of Argentine Tango. She is known as La Negra, and by calling her by her affectionate nickname, we got another viewpoint of political correctness. Her Women’s Technique Class held in the huge Robles Gym late in the afternoon of a hot California Summer in 1995 is still talked about. There were about one hundred women all standing at the unusual position for social dancers, at the ballet bar. We were asked to perform the perfect and exquisitely painful technique of the forward ocho as explained by Graciela as something that emanated from the torso and the center axis of the body, down to the big toe and going from there to the rest of the foot, culminating into La Negra’s idea of a properly executed front ocho. We stood at that bar for over three hours, long after the appointed hour that the class was supposed to be over. Earlier smiles were wiped off our faces, replaced by sweat and earnest concentration. La Negra walked up and down the rows of women with the demeanor of a queen combined with the attitude of the strictest ballet master, making gentle corrections and never letting on that she was either pleased or displeased with our efforts. Later on in New York, I took a private class with her, where we continued the same drill for two hours. At the end of the class she told me that when I visited Buenos Aires three months later, if I had practiced my front ocho enough to her satisfaction, we would continue the lesson with perhaps, the back ocho.When Nora Dinzelbacher announced that she would bring La Negra to her 1998 version of Tango Week (replacing the now defunct Stanford Tango Week), I was curious about what Graciela would bring to us this time around. She felt a little disappointed with herself after her first visit to the US at Stanford ‘95, feeling that she didn’t emotionally reach the people, that they didn’t understand her way of teaching or appreciate her seriousness. She wanted to revamp a bit, without losing her integrity. She presented her first classes using American music, asking the couples assembled to dance the music with the same emotion that they danced as teenagers. She asked that they not dance tango steps, and to rely on a sense memory that she hoped the music would evoke. She wanted them in touch with their own bodies, and the body of their partner. Later in the advanced class, she presented challenging material, not in the form of another quickly forgotten complicated figure, but by showing the partners how to look for angles in body alignment to invent and improvise figures. Sounds simple? Let’s just say you had to be there, to watch some of the country’s best dancers struggle with the concept and execution. No one left her classes without being enriched and challenged. By midweek, the legendary Women’s Technique class was offered at the huge Allegro Ballroom, minutes away from the Tango Week site at The Holiday Inn. The large space was needed to accommodate almost every woman in attendance of Tango Week. No one wanted to miss this class. Many of the women had been at Stanford ‘95, and were looking forward to the challenge, wondering if we would get to work on back ochos, three years later. Surprisingly, there were no ballet bars this time. The next surprising thing was that Graciela asked that we remove our shoes and sit down! A kind of peaceful, reverent hush fell over the room. She presented us with some circular breathing exercises, coaxing us to move the air up into our chests and torsos. She talked at length about the way to stand in order to dance Argentine Tango, with the body weight slightly and naturally forward, with breasts (chests) over the feet. She called this the basic posture. She talked at length about the porteña attitude assumed in dancing Tango. She demonstrated how a porteña would sit at the milonga in order to invite a dance. The posture was similar to the basic standing posture, torso elevated. She explained that it is almost confrontational, an expressed desire to get what is yours, to be let in from the outside, an expression of that ever present longing of the long ago immigrant culture excluded by the upper class native land owners. Of course she explained the ever elusive (for American dancers)gaze that Argentines use to get each other onto the dance floor. She also spoke about the woman needing to empower herself in the dance, to claim and keep the space she defines with her forward body position. She told us to give ourselves permission to dance, in essence to be the equal partner. She got us back on our feet, and moving with partners, using our chests aggressively thrust out, to play a cat and mouse kind of game to induce mutual movement. Some of the women got wild with this exercise, running around the room and falling on the floor! The energy level was tremendous. She revisited the subject of the forward and backward ocho, stressing again the technique of it beginning with the forward basic stance, breasts out over the support leg, leg movement starting with the big toe… oh well you know the rest. We didn’t have ballet bars, so we got into couples and practiced ocho technique for a little while. Two hours had passed quickly, and it was nearly time for the last exercise of the class. La Negra instructed us to stand and face the mirror. The proposition was to use the basic Tango posture in movement; to imagine being on the stage in front of 10,000 people, perhaps on Broadway, to dance the performance of our life, and to never lose our own gaze in the mirror, to look ourselves in the eye constantly as we danced. We lined up in several rows at the back of the room facing the mirrors, each woman looking at herself. An expectant hush fell over the group as we readied ourselves for the curtain going up. Then she put on the music: the sound filled the room, Whitney Houston singing Hero. She must have played the thing three or four times. It’s not a little three minute Tango, and it has compelling words and music, popular enough to be familiar to everybody. An amazing spontaneous “choreography” ensued, with sixty or so women moving as individuals and as a group. It proved to be moving and emotional and it became the defining and pivotal mid Tango Week cathartic experience. It was the release and that permission giving catalyst that we needed. It enhanced the rest of the week’s classes and milongas, and for many raised the bar for their dancing, taking them to the next personal plateau dancers always strive for. At the end of the session there were tears, quiet moments of reflection and a heartfelt appreciation for La Negra’s unique Women’s Technique class. Later in the week, at an afternoon Tango talk featuring the women teachers, we were presented with some terrific role modeling. Guillermina Quiroga and Graciela Gonzalez credited Pupi Castello with their education in the world and ways of the Tango. They spoke about him, in his presence in the audience, with such love and respect, that he left the room overcome by emotion and tears. He was very proud of his two Tango daughters, each having respected careers as Tango professionals. Mina and La Negra both said that Pupi taught them how to exist in the life of the night, that he not only taught them how to dance, but how to understand the codes of the milonga, irreplaceable and valuable life lessons that they still carry with them today. Someone in the audience asked Graciela what a woman should bring to the milonga. It was one of those esoteric questions that might result in some dreamy ideas of what essence or nuance is required. La Negra answered with a frank and startling revelation saying that what she brings to the milonga is her survival kit that includes a pair of flat shoes, a toothbrush, money and condoms. She also advised us to know what we want from the Tango that night. Her surprising answer made everybody laugh and put a reality spin on what dancing Tango in the milonga is really about, i.e. to mate. 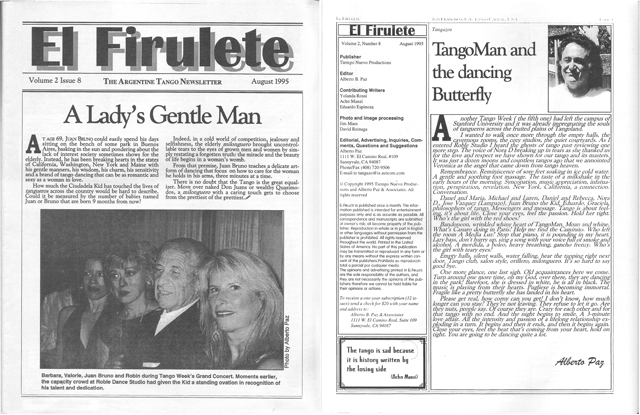 The first time I saw El Firulete was mid week at the 1995 Stanford Tango Week. It appeared on a table in a messy pile of local fliers. It stood out and caught my eye. It’s black and white design with this astonishing drawing on it’s cover, looked different. I wanted to see what it was. At first I didn’t concentrate on it. I casually flipped through the pages and threw it in my tote bag. I was new to the world of Argentine tango, new in fact to the social dance world in general. I didn’t get a lot of things I saw that week. Like writing your name on a cheap plastic cup at a dance, so that you had to use the same glass all night. I thought this a rather quaint and typical California political statement on recycling. I came from the world of event design where my clients went through five Crystal glasses per person during the usual three hour cocktail party. Plastic tablecloths, cheap fliers, bad lighting, minimal decor – well it was all so unexpected for the fancy lady from New York City. At that time I was still wearing my designer clothes to dance in, making a fashion statement (since at this time I couldn’t express myself through the dance). Later on, in my little dorm room on the Stanford campus, I took a closer look at the little black and white publication. After reading for a few seconds, I realized a new found friend had produced it, and that he had written a few articles. I knew he was a native of Argentina, so I was very impressed by his writing in general, and in particular, his writing in English. I discovered a lot of good information and pictures. The only thing I didn’t like was that it was too short. So I re-read it again and again. Later on I complimented my friend and asked him who helped him with getting this monthly publication out. Who financed it? Who distributed it? Who did the graphic design? Who got the advertising? He said that it was his one man baby, something that he had started a year before. His reason? The Argentine tango community had given him so much, and he wanted to give something back. He got himself a publishing program for his computer. Armed with a good Spanish/English dictionary, a book on black and white graphic design and a natural ability to write in two languages, he produced El Firulete. I promised to subscribe. As many of you know, the man is Alberto Paz, and that trip to the 1995 Stanford Tango Week changed both our lives, to the extent that we became partners in life. Shortly after moving to California to be with Alberto, we embarked on a life, keeping a mutual promise to do things that mattered to us. We reckoned at our age that we had twenty (or so) more years of healthy productive life on this earth, and we owed it to ourselves to live accordingly. Argentine tango became the centerpiece of this life together. Both of us had extensive life experience, including lives as business people. He an electronics engineer and inventor, and me an artist turned event planner. We abandoned our businesses, as they had become empty exercises creating little if any joy. As once successful entrepreneurs we knew the formula for success is based on doing something you like as your “job.” It was necessary for us to still make a living, so we joined forces, and our company Planet Tango, was realized. I was to handle bringing the world of Argentine Tango into the event design mainstream and vice versa. Another opportunity came our way by two Argentine teachers asking us to help organize their classes and workshops when they visited our area. Logically, we thought we could became agents for teachers, dancers, shows and musicians, while we developed our own teaching career. And then there was El Firulete, which I considered Alberto’s baby and territory. A few subscriptions barely paid for the paper, ink and postage, but then El Firulete was a love child. I never thought to encroach on Alberto’s expertise and turf. All couples know that each individual needs their own space. After months of adjusting to our income from Planet Tango being far from the reality of the usual business world we were both accustomed to (I once remarked that the money we worked so hard for in a month’s time would barely cover my old taxi fares around New York City in a week! ), we settled into a much simpler life. We were in the dance business, and not even the lucrative ballroom dance business, but the quirky poor step child known as Argentine tango. Strangely though, we were happy. We were free, getting healthy, dancing, teaching, learning, traveling and entertaining folks from Argentina in our home. Alberto was writing up a storm. Little by little I started to help with El Firulete. First collating, assembling, folding, stapling and stamping them for the mail. Everything was done at home on our computers (and at Kinko’s) and on our dining room table. Everything was done by us. Alberto would ask my opinion on this and that, especially regarding the graphics since I am art school trained. He has excellent instincts, so instead of trying to do a make-over, I would simply bring him other magazines whose layouts I liked. I thought we might have a great cover every month, maybe put a picture of a good looking Tango personality on it. There was very little material available then, so we improvised. I started to do photo collages of the local scene and write a gossipy column. Copy editing chores also became my domain (a craft I admire and still continue to train for on the job). A few months after I moved to California we took our first trip back to New York City together. A reunion with my tango friends there alerted me to another viewpoint. I proudly handed out our current issue, and the response was polite. I asked, what’s missing? The answer was that El Firulete was too local. So Alberto and I talked it over, and decided to try to make El Firulete more national, more international in scope. We wanted to take it from a local newsletter to an international magazine; to be informative and interesting for many. Of course, some home town people let us know that they missed seeing a photo of themselves in every issue, but we were certain that we were on the right track. Our trips to Buenos Aires, meeting people from all over the world both here at home and on the road, our increased study and knowledge, all culminated in what our readers saw five years later. We also kept growing as writers, publishers and editors. After five years El Firulete was still self produced, although there had been conversations about selling it to a publishing conglomerate. We were always looking for writers, artists and photographers to contribute. We had thought about going to color, even if it was just the cover. We had thought about more glossy mainstream paper. We had thought about changing the size. In the end, and for time being, we kept the black and white (and gray) format as a classic expression. The size and format had become recognizable and hence classic. We have had good and bad imitators. Twelve issues with up to twenty four pages doesn’t seem like a such a big deal to generate material for. It seems easy, until one attempts to do it. Our traveling teaching schedule complicated this, in a way someone with a full time job, besides the full time job of producing a publication, encounters. By full time, I mean that for Alberto, twelve to fourteen hours a day spent at the computer keyboard. Not to mention reading and re-reading for editing purposes. Not to mention the clerical work of dealing with mail and subscriptions and the aforementioned assembling and mailing of the magazine. Our subscribers were loyal and helped finance ink and paper and postage. It is still Alberto’s love child, and it is now my love child too. It is still our way to give back, because we continue to get so much from all of you: our readers; our friends; our students; our families; our teachers. Argentine tango has been very good to us, and we hope to continue to be very good for Argentine tango.